What savory foods are you preparing for Thanksgiving? Any recipes made with pumpkin? Pumpkin pie is a perennial favorite at our fall gatherings, but this year we're also experimenting with something new -- pumpkin soup! Why pumpkin soup you ask? We just finished reading and listening to a cute story all about pumpkin soup. Is there such a thing as too many cooks in the kitchen? Duck, Cat and Squirrel enjoy making pumpkin soup together. Each animal has his own specific task -- Cat slices the pumpkin, Squirrel stirs in water and Duck adds the salt. Happy with this set-up, they cook up delicious batches of pumpkin soup. 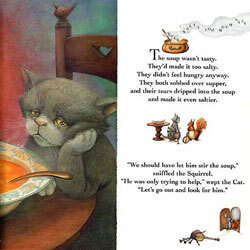 But one day Duck decides to take a turn at stirring the soup and ends up stirring up a mess of trouble instead. Luckily friendship reigns and the trio eventually sort things out. Soup makes everything better, especially when prepared together with thoughtful, sharing friends! 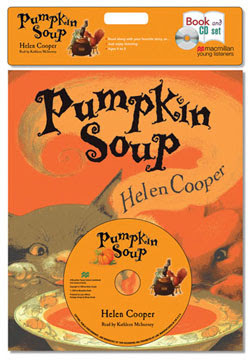 Cooper's Pumpkin Soup won the prestigious Kate Greenaway medal in 1998. The illustrations of the animal friends and surrounding woods are top-notch and completely adorable. Cooper doesn't scrimp on the details. Readers who look closely are awarded with little treats like pumpkins on the china, a pair of tiny bugs that watch the story unfold and other interesting carvings on the furniture. It's worth a re-read just to have a chance to stare that the pictures! The book is the first in a trilogy, preceding A Pipkin of Pepper and Delicious! Pumpkin Soup is a book that's a lot of fun to read-aloud. The liveliness, drama and pacing of the text also makes it the perfect choice for the audiobook format. Kathleen McInerney skillfully uses her voice to play up the dialog between the friends and bring life to the characters. She even makes slurping noises! Early on in the book, readers learn that the animals like to perform music and the audiobook background tunes add to the musical flavor already alluded to in the book. We did notice a few differences between the written and spoken text (trudged is trotted in the book and the narrator substituted the word pleased for happy), but the changes didn't detract from the listening experience. Also, for those with beginning readers should be aware that this audio version does not include page turn signals. It's not a big deal for us, but I know those page turn signals matter to some listeners. We had read Pumpkin Soup together in the past before we received the review copy, so it was especially interesting to hear it narrated by a professional. After listening to this audio, I think I need to work a little more on my own read-aloud performances! Now that my daughter is able to read herself, she loves following the words, discovering new words and learning the correct pronunciation of those she does not know. It's great for her to have the chance to listen to skilled narrators use voice inflection and other narration tricks. Her enthusiasm for audiobooks rubs off on her little brother, too. Listening to audiobooks is an activity that both my kids can enjoy together, at home and in the car. Macmillan Audiobooks for Young Listeners offers several other titles for children including Snow by Uri Shulevitz, Shrek by William Stieg and James Herriot's Treasury for Children. I'm hoping to bring home a few more of Macmillan's audio titles soon for my kids to enjoy. 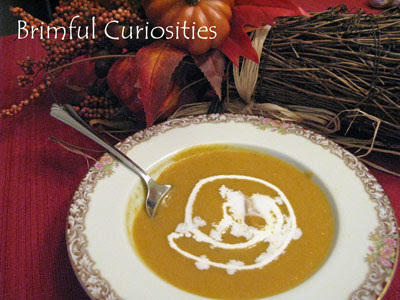 We felt a little hungry for pumpkin soup after reading this story. The Pumpkin Soup paperback version provided with the CD did not include a pumpkin soup recipe so I turned to other blogs for suggestions. The most enticing recipe I found was one on Brown Eyed Baker that includes apples (although The Pioneer Woman also recently published one that looks delicious, too). While it was tempting to try a recipe made out of an actual pumpkin, I had a few older cans of pumpkin in my cupboard that I wanted to use in a recipe, so I opted for Pumpkin Soup with Apple & Spices recipe. It turns out the book was a bigger hit than the soup. While my husband and I thought the recipe turned out OK, after one bite our kids refused to eat it! I can't say I can completely blame them. I didn't like pumpkin-y foods when I was a kid either -- not even pumpkin pie! Let me know if you have a to-die-for pumpkin soup recipe you think we'd enjoy. I'd like to give pumpkin soup another try sometime. Our house did smell delightful while we were making the soup! This is the reason I don't make pumpkin foods - nobody in the family eats them. Too bad, because I actually like them. The book looks pretty nice, the plot reminds me of something else we read that followed a similar story line.